Buona Restaurants, created in 1981, represents the Company’s first division established in Berwyn, Illinois. Since then, the chain has expanded to seventeen locations varying in size from 3,000 square feet to 5,500 square feet. The casual, upscale quick service restaurants feature the world famous, award winning “Buona” Italian Roast Beef sandwiches for lunch and dinner. The menu also includes authentic Neapolitan pizza, hand tossed salads, café sandwiches and grilled Panini. The newer restaurants are brightly colored with the feel of a fresh market or kitchen, showcasing real food in a warm, comfortable dining room with seating for 90-150 guests. Featuring a drive-thru and a carryout section, take-out orders make up approximately 50% of sales at any given restaurant. Additionally, Buona’s Catering Counters, conveniently located within each restaurant, offer customers bulk Italian Beef and other prepared foods by the pound. Buona Catering, created in 1982, provides customers with off premises catering and comprehensive service. A very broad menu, including various buffets, are coordinated by our professional party planners and offered for many social and corporate clients. The Buona Catering division now operates in a newly renovated 28,000 square foot facility, including sales office, kitchen commissary and a distribution center. Catering customers include many well known organizations, such as Anderson Consulting, Arrow Electronics, Chicago Transit Authority, Regent Products, SEIU Local 1, McDonald’s, Pepsi Cola, United Airlines, as well as many others. 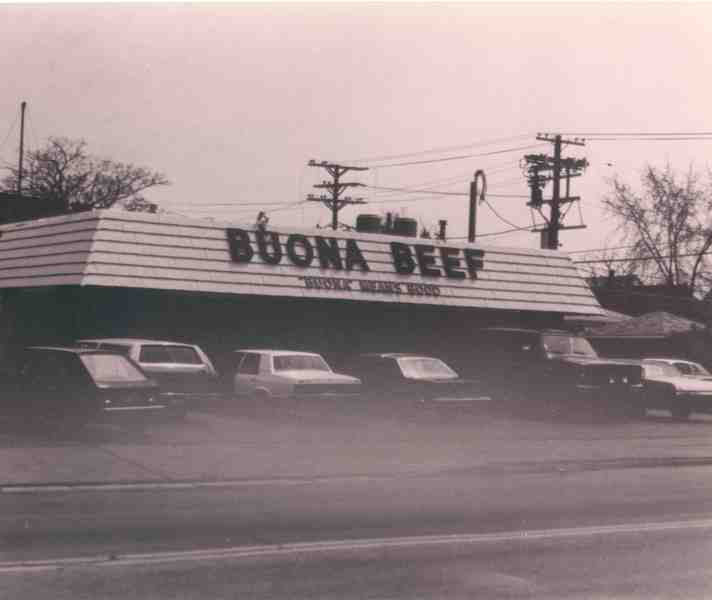 The first Buona Beef opened in Berwyn over thirty years ago. Patriarch Joe Buonavolanto Senior took a second mortgage on his home to fund it, and dug the foundation for the restaurant himself, with two of his five young sons in tow. The entire brood chipped in as the restaurant gained a steady following. The original Italian beef recipe was concocted by Joe’s wife Peggy, with the help of their Uncle ‘Junior’, proprietor of Chicago’s iconic Mr. Beef. The process is painstaking, and ardently adhered to by generation after generation of Buonavolantos. The family’s belief in themselves and each other paid off – over the years, the group has expanded to 20+ locations, and their growth plans are aggressive. Joe Senior’s five sons each worked their way up from serving customers and washing floors to running the key functions of the organization. The atmosphere in the executive office is harmonious, as love, respect, compassion, and pride are the core values that unite the brothers, and the Buona family of employees. While the menu has expanded, the original beef recipe has not been compromised, and for the three generations of Buonavolantos who are active in the company, compromise and quality are never uttered in the same breath. The family’s devotion to each other, and to the family legacy, has created a powerful brand that is true to their parents’ founding principles.